The annual spatial@ucsb.local2018 Poster and Plenary Session will be held on Wednesday, June 6, 2018 at Corwin Pavilion, from 9:30 a.m. to 2:30 p.m. 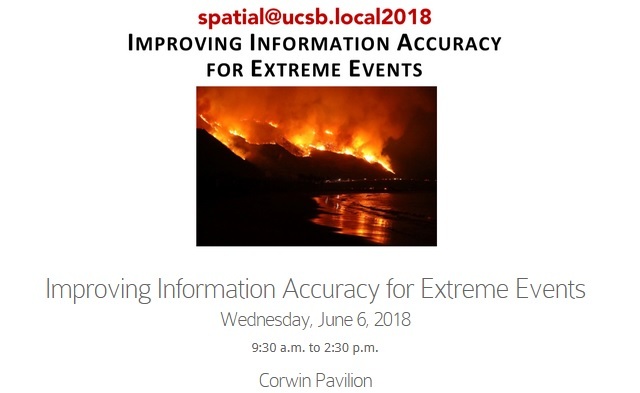 This year’s theme for the event will be Improving Information Accuracy for Extreme Events. Keynotes will be from Chris Renschler (Dept. of Geography, University at Buffalo) and one more TBA. For invitation, agenda, and speaker list, please visit here.